In 1975, Bill Gates created Altair BASIC. Altair BASIC is an interpreter, a program that translates human language into the zeros and ones a computer can read. It was a breakthrough, paving the way for programmers everywhere to work more freely. Gates’ creation would go on to change the world. Incredibly, it only took him three weeks to complete. Cal Newport is a scholar and associate mathematics professor at Georgetown University. He’s also the author of Deep Work: Rules for Focused Success in a Distracted World. 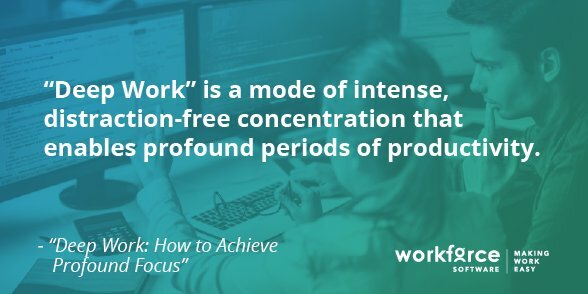 In his book, Newport references Gates’ ability to tap into “deep work,” a mode of intense, distraction-free concentration that enables profound periods of productivity. “Deep work is a state where your mind is free of attention residue and, therefore, is operating at the highest level of intensity that it can,” writes Newport. Attention residue is distraction caused by lingering thoughts, conscious and otherwise. In other words, when you transition from one task to another, your focus doesn’t fully transition in tandem. Part of your attention stays stuck with the last activity. For example, imagine you’re working on an important presentation. If you leave it to check your Twitter, even for a moment, you’ll carry attention residue from the tweets you were reading into the presentation you’re creating. “Until that residue clears out, which could take up to 30 minutes, you’re operating at a reduced cognitive capacity,” said Newport. Comprehension: You’ll learn dense, complicated subjects faster. Output: You’ll produce better work, and more of it. Deliberate Practice: A difficult exercise that helps you grow through failure. Flow: An optimal state of consciousness in which you feel and perform at your best. Deep work can leave you inaccessible and unresponsive, distant. Long, solitary concentration doesn’t always deliver. When it does, though, it can have a major impact on your ability to get things done. In his book, Newport highlights four “rules” beginners should follow. To achieve deep work, you should schedule it into your day. It should be a conscious, deliberate decision. Monastic: Deep work that takes place over a long period of time. This could be weeks or months, even years if you have that luxury. This is an optimal route for people who want or need to immerse themselves in a project or discipline, the way Bill Gates did with BASIC. Bi-modal: Takes place over two or three days. Journalistic: Lasts moments. Used only by the most disciplined and structured people. Let your lifestyle inform your approach. Then hold yourself accountable for sticking to it. Focus is like a muscle: Use it and it’ll grow. The more focused you are in general, the easier it’ll be to resist temptation when deep work is on the line. Go for a walk while holding a professional problem in your head. As you stroll, work on solving that problem, step by step. Bored in line at the grocery store? Push through it. Bored watching commercials? Wait them out. Bored at the DMV? Endure. If you practice being bored, it’ll be easier to resist your phone when it counts. Social media isn’t evil, per se, but it is distracting. Platforms like Twitter and Facebook produce a tremendous amount of nonessential information, which diverts attention away from work and costs the U.S. economy alone $650 billion a year. “We have a growing amount of research which tells us that if you spend large portions of your day in a state of fragmented attention – where you’re constantly breaking up your attention to take a quick glance at, say, Instagram – that this can permanently reduce your capacity for concentration,” said Newport. Deactivate your social media accounts for a week. Commit to not checking in. See how it feels. You may like it. If it’s not deep work, it’s shallow. In other words, it’s not that hard to replicate. For instance, most knowledge workers consider “answering emails” to be shallow work. Batch your email time into two scheduled sessions: Once after lunch and again before quitting time. No checking outside of that. Note: If you can, aim to do the bulk of your shallow work later in the day, when your brain is at its weakest. At 19, Gates dropped out of Harvard and moved to Albuquerque to start Microsoft with his partner, Paul Allen. Of course, it all started with a product born out of intelligence, innovation, and deep work.